One of the first pieces of advice you’ll hear about getting what you want out of life is that you need “balance.” It sounds nice, but what does that mean in real life? 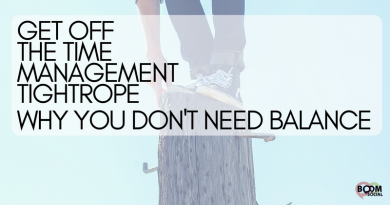 Let’s look at how you can get off the time management tightrope and why you don’t need balance. Recently Nick Wallenda walked a tightrope across a 1500-foot gorge near the Grand Canyon. He carried a very long pole and walked on a thin wire. TV viewers and the watching crowd were glued to his every move and gasped when he faltered. What would have happened if a large bird had landed on one end of the pole? What if Nick had looked away or lost concentration? His stunt—and his life—would have been over. His balance depended on a carefully controlled set of circumstances. People talk about juggling priorities, keeping all the balls in the air. What happens if someone starts adding more balls or if they drop some of the balls? The rhythm is upset and the balls come crashing down. The fact is, balance assumes that everything stays the same and that you have complete control. Balance hopes that nothing unexpected happens and that you’re not asked to do something extra. I don’t know about you, but my days are all different and unpredictable! Sick kids, a leaking dishwasher, a plugin update that crashes a WordPress website—and balance goes out the window. So should we just forget it and let the chips fall where they may? Absolutely not. There’s a better way to view our lives and how we manage our time. But first we have to get past the guilt and frustration caused by constantly striving for the myth of balance and perfection every day. We don’t have a home life and a work life and a personal life and a marriage life and a whatever life. We have a LIFE, and there are ways to do the things that are important to us and not neglect our relationships and priorities. After all, a successful life includes all the areas of your life. If you have a successful business but you neglect your spouse and end up with marriage issues, that’s a problem. If you have a spotless house but your online business is sinking, that’s not what you wanted. When I was in high school, I played clarinet in a band. We had marching band during football season, concert band in the winter and stage band in the spring. Our small school band consisted of trumpets, drums, flutes, trombones and other instruments. We played sheet music written by a composer. Our band director was in charge and he decided how to interpret the music and get us to play the pieces. He directed us when to play softly, he signaled certain instruments when to rest, and he let us know when to change rhythm. We didn’t always play our instruments all at once. Sometimes there was a solo and everyone else had a rest. Different instruments played at different times, with different notes and it all came together as music. I don’t recall that we ever played a musical piece that was perfectly “balanced,” where every single instrument got exactly the same amount of playing time, or we all played the same notes at the same tempo and volume. No, all the different instruments and rests and solos and parts came together in harmony. It was the harmony that was beautiful and made sense. And THAT is what you’re creating with your life management: harmony. You are both the composer and the conductor of the music of your life. As the composer of your life, you decide what you want the music to sound like. You choose what you want your life to look like and where you want to end up. If you’re having trouble coming up with this, start with what you DON’T want, and it will help you realize what you DO want. Like a piece of music, sometimes one area of your life will sound louder and require more time and effort for a season. That doesn’t mean the rest of your life is silent and you can forget about it. Like a conductor holding out his hand to signal a player to soften the volume, communication and adherence to the music eventually brings that instrument back into the melody at the right time. In the same way, sometimes the kids have to wait for you to finish a project before they get your full attention. But if your musical score—what you want in your life—includes a happy family life, you know that this can’t be the norm nine times out of ten. You can relax knowing that this busier season is temporary, a movement in the music where your project is louder and family has more of a background role. When you’re on a date with your spouse, the marriage instrument is a solo and everything else has a rest. As much as we wish it wouldn’t, this solo comes to an end and the rest of life comes back in with swelling volume. Life is like a symphony, where instruments move in and out in volume and intensity, creating harmony. If something unexpected comes up, it gets louder for the moment and the rest of the instruments adjust their roles, following the conductor. Just make sure you’re playing the music you’ve written and directed, rather than allowing the instruments to get out of control. Trade the time management tightrope and its tension for a life management symphony. The parts of your life will move in and out while the tempo and volume change, but you can create harmony. Rather than striving for balance that doesn’t exist in an imperfect world, compose the life you want. Then manage and conduct the parts to create your life masterpiece. Charlotte Siems is a happy wife and mom of twelve who is a speaker, author and coach. After losing 100 pounds with T-Tapp, she became a Master T-Tapp Trainer, sharing her encouraging story with people all over the world. She has built a successful online business and writes about family life and T-Tapp at www.ThisLovelyPlace.com. Charlotte’s life experiences and training have uniquely qualified her to help others create a successful family and business. A provocative look at time management. Great job, Charlotte! I really hate the work “balance” because I’m a creative person and sometimes creativity is the most unbalanced thing you can do. Doesn’t mean I don’t try, but really, take time to have those moments or your life will pass you by. Yes, balance can be very tough for creatives. It is something that you should work towards though – small steps as you can. I really hate the term work/life balance because we can never really balance the two. I like the idea of looking at it as a symphony and trying to create harmony between the two. Thanks for sharing Charlotte. The word ‘balance’ is what covers it all in life. In anything someone is doing balance should be the most considerate aspect.